These heartworm forceps are basically modified blunt-nosed alligator forceps. This particular one is at least 40 years old and was inherited with the practice many years ago. There is a running joke among staff that these forceps have 101 uses—it’s just that we have repurposed them to do everything except that for which they were designed. 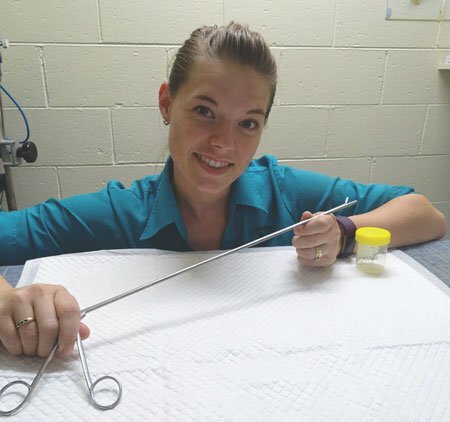 As a bird, reptile and exotics clinic, we use these forceps for a number of serious procedures. They are perfect for foreign body extractions, including removing fish hooks from large monitors and turtles. We’ve used them as a stylet for a gavage or feeding tube with long-necked birds such as jabirus and pelicans. We’ve used them to pull the sink plug out from under a bathing crocodile. We’ve even used them to retrieve dropped food items, including fish and rodents, from the cage of a hungry raptor. Whenever we are in a difficult situation, we reach for the trusty heartworm forceps. They are autoclaveable, versatile, rigid, lightweight and easy to operate. They can be used for 101 different things. These days, there are modern instruments that have replaced this old style of forceps. They are often used during endometrectomy procedures where they reach out and collect the worms rather than nip them up like the old forceps did. There are also more preventative treatment options available now and a lot more awareness about heartworm in dogs. The only negative about this specific set of forceps is that they have been superseded and are no longer available. ProVet carry a range of these.